On Wings of Eagles: Does God honor you? Therefore the Lord, the God of Israel, declares: ‘I promised that members of your family would minister before me forever.’ But now the Lord declares: ‘Far be it from me! Those who honor me I will honor, but those who despise me will be disdained. Ninety one years ago, a remarkable man did a remarkable thing. Eric Liddell of Scotland refused to run a heat at the 1924 Olympic Games in Paris because the race was scheduled on a Sunday, which his faith taught him would violate the Sabbath. The account of the race in the July 12, 1924, Times of London conveys the excitement of that day in Paris: "Liddell had the outside berth -- generally considered the worst place .... There was a perfect start, and from the first jump-off the pace looked, and was, terrific. Two men of the six fell .... But that made no difference, for there was never more than one man in the race, and it was the pace he set that fairly ran them off their legs. Sweeping round into the straight Liddell led by four or five yards, and increased his lead by a couple of yards more in the run home. No one ever looked like catching him .... "When the time was given out as 47 3-5 sec., and it was realized that, for the third time in two days, the world's `record' had been lowered, the Stadium went insane ....'' When Liddell left Edinburgh for China the following year, the number of people wanting to bid him farewell was so large that 1,000 were unable to get in. Twenty years later he was taken prisoner with other missionaries and Westerners and became one of 1,800 crowded into a Japanese camp. His personal space had shrunk to 3 by 6 feet. Before his arrest, Liddell managed to get his wife and two children to safety in Canada (Florence Liddell was pregnant at the time with their third daughter, whom Eric would not live to see). He died of a brain tumor on Feb. 21, 1945. His biographer Sally Magnusson recalled that most people who knew Liddell observed the consistency of his life. She tried to learn whether he had "clay feet.'' In her book, "The Flying Scotsman,'' Magnusson thought she might have discovered something when she "happened on a disillusioning eyewitness account of the behavior of some of the missionaries in the Japanese internment camp where Liddell spent the last months of his life. `It is rare indeed when anyone has the good fortune to meet a saint, but he comes as close to it as anyone I have ever known.' Of course, he was talking about Eric Liddell.'' Magnusson adds that thousands of people live similar lives in obscurity and the world does not know their names. 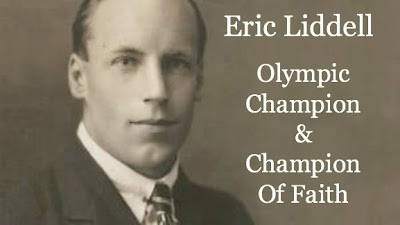 "And the first to remind us of that would be Eric Liddell -- who would be full of embarrassment at the very idea of being the subject'' of a book or film. Press accounts of the 1980 premiere of the film in Edinburgh told of huge crowds. How fitting. The people of Scotland, who had shared their native son with China, were welcoming him back and affirming the note given to Liddell by his masseur before that 1924 race. It referred to the Biblical passage 1 Samuel 2:30: "He who honors Me, I will honor.'' And so He did. And so He still does 91 years later. Dear Lord, help us honor You in everything we do so that You will honor us. Help us not do things that bring honor to us. In Jesus’ Name, Amen.